Built in 1805, Bowcliffe Hall is set in twenty eight acres of spectacular grounds, superbly located just 5 minutes drive from the A1M, four miles South of Wetherby. 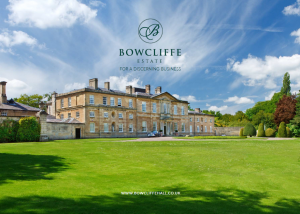 Whilst retaining the stately atmosphere of a desirable country house, Bowcliffe offers all the amenities expected of a modern office and meeting venue. Taking a serviced or unserviced office on the Bowcliffe Estate is a lifestyle choice. We offer a unique, uplifting work environment and seek to support and assist you in any way we can to make the day to day running of your business and the happiness of your team, the best it can be. Join our running club or weekly Pilates sessions, have your car valeted or your dry cleaning collected – anything we can do to help you, we will. All you have to do is ask. Offering beautiful period offices with many original features, or, more contemporary, open plan spaces; all offices are business ready and have the advantage of natural daylight, many with impressive views across the grounds. With an on site IT advisory service, free car parking, bicycle storage, electric car charging points and many offices with shower and kitchen facilities, we strive to cater for your every need. Anyone taking an office on the Estate is entitled to free membership of our private members’ club, the Bowcliffe Drivers’ Club, located in Bowcliffe Hall. With décor inspired by the glamorous 1920s and the Golden Age of Motoring, our signature chef, Andy Lawson, creates delicious breakfast & lunch menus and all day refreshments, making the Drivers’ Club the perfect location for informal meetings or simply taking a break from the office.